Roaring Fork High School students make their way past the new entryway security vestibule on the first day of the new school year Wednesday. Visitors must now pass through the security zone during the school day, as part of the security measures that were included in the Roaring Fork School District's $122 million bond issue that was approved last year. Students and visitors to some Roaring Fork School District buildings were met with new security features on the first day of school Wednesday. The new measures are part of the $122 million bond issue that was approved by district voters last fall. Several schools, including Sopris Elementary School in Glenwood Springs, and Crystal River Elementary and Roaring Fork High schools in Carbondale, have new visitor entry vestibules that will be in operation during the school day after students have arrived. 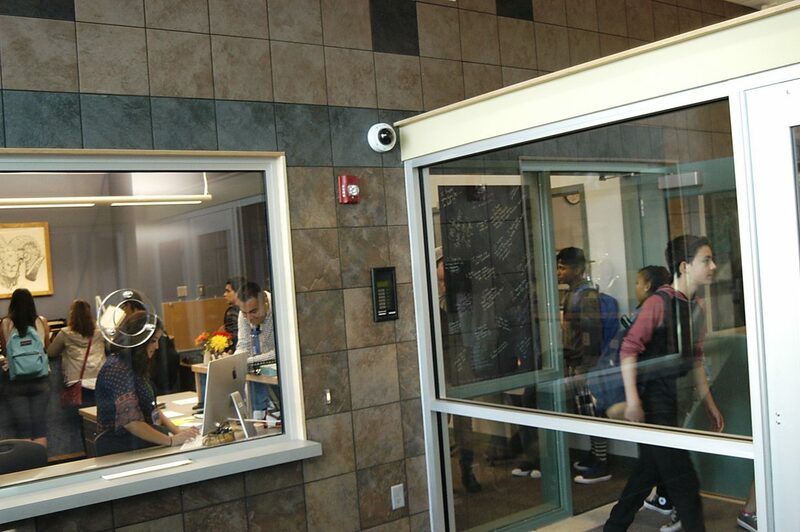 The controlled entries require daytime visitors to check in at a secure front office window before being allowed access into the school once stating the purpose of their visit. A separate set of doors at the main entry and elsewhere in the school buildings will be unlocked when students are arriving and leaving before and after classes begin. Those doors will be locked during the remainder of the day. Jeff Gatlin, chief operating officer for the school district, said the primary purpose of the controlled entries is so that school staff is aware of who is in the building and to ensure the safety of students, teachers and staff. All district schools are scheduled for safety features and a variety of other improvements as part of the bond issue, in addition to the bigger-ticket items. Major projects include a new $34 million K-8 school at the district-owned Eastbank site south of Glenwood Springs, $20 million toward the roughly $30 million overhaul of Glenwood Springs Elementary School, and $15 million to start a teacher housing program in Glenwood, Carbondale and Basalt. The security features were not specifically earmarked within the bond issue, but are part of the general school and district facility improvements that are being paid for out of the bond funds. The new Eastbank and GSES facilities that are now under construction will include similar security features, Gatlin said. Additional security features, some of which are being paid for outside of the bond issue, include new exterior door monitors and cameras monitoring the new entryways, new building intercom systems and new phone systems, Gatlin said. The safety vestibules are designed in such a way as to not be too imposing, he said. The architecture of each building will also determine the design of the secure entries, so not all of them will be the same, Gatlin said.